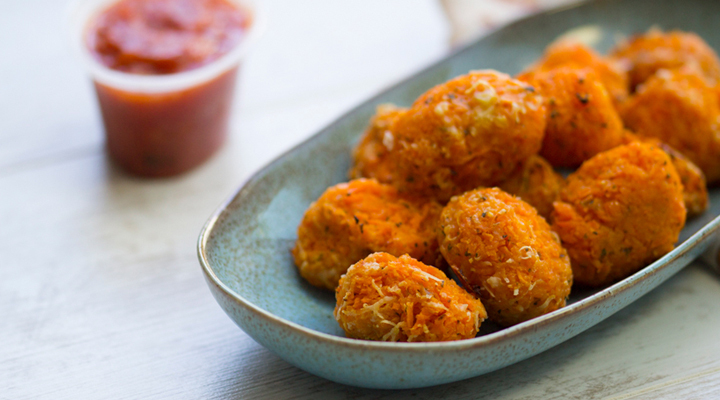 Healthy and delicious, these sweet potato tots are a perfect finger food for your weaning baby and are a great snack for the whole family. Try them out now! 1. Preheat oven to 200°C and line a tray with a baking sheet. 2. Steam the cubed sweet potato until you can pierce them with a fork but still too tough to eat. 3. Put the sweet potatoes and parmesan cheese in a food processor. Pulse a few times to break the potatoes up. 4. Once processed, fold the mixture a couple of times, making sure you have a chunky mashed texture. 5. Form into small balls with your hands and then roll each tot on to more parmesan cheese – just enough to lightly coat them. 6. Place on the baking sheet and cook in oven for 12-15 minutes, turning them at least once mid-way so they cook evenly on all sides.